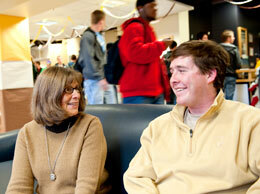 Retired ASUW Business Manager Lorraine Lupton visits with ASUW President Matt Haigler in the Wyoming Union. The Associated Students of the University of Wyoming Senate has voted to establish a $25,000 endowment honoring longtime ASUW Business Manager Lorraine Lupton. The Lorraine Lupton Legacy Endowment will support financial literacy programs offered through the UW College of Business, says Tyler Neasloney, ASUW director of public relations and marketing. It recognizes Lupton's 22 years as ASUW's business manager. "In my tenure at the University of Wyoming, one of the highlights was working with Lorraine Lupton," says Matt Caires, assistant dean of students. "Her financial acumen has helped to put ASUW at the forefront of student governments in the country." While at UW, Lupton, who retired this year, managed budgets for Student Media, Students' Attorney, ASTEC and the SafeRide program. She also served on committees for Weeks of Welcome and the Wyoming Union renovation, and now serves on the UniWyo Credit Union board of directors.